Best Look Paint comes in Interior and Exterior finishes. Visit Zettler Hardware! Looking for some quality and variety in your paint and want to discount shop while in the process? Observe those other stores no further! We carry exterior Best Look paint and Interior Best Look Paint. Zettler Hardware carries some of the "Best" in paints, stains and more. Visit us for your next stain or paint project. 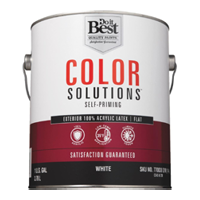 Best Look® Paint and Primer in one is an ultra-premium paint that allows an mervellous presentation in stain resistance, scrubbability, and hide. This product can be applied directly to previously painted surfaces or uncoated drywall without a primer, making your paint project hasty and hassle-free. Let Best Look® Paint and Primer in one from Zettler Hardware transfer your household into a special style of color and lasting good looks. We carry gallons of paint or even 5 gallon buckets for the larger DIY projects on your honey-do list. When only the most outstanding will do, choose Best Look® Paint and Primer in One! Best Look® Paint and Primer in one Interior has long-lasting benefits. Approved interior uses; Drywall, plaster, masonry, bare wood, paneling, cabinets and trim, and also previously painted surfaces. Remark: Although a primer is not necessary, using two coats of Best Look paint and Primer in One Interior paint is recommended when painting over uncoated surfaces and when using vibrant or dark colors. Use dark base coat primer under recommended colors to reduce the number of topcoats needed. Low-temperature application down to 35 degrees F.
The recommended exterior uses; Vinyl and aluminum siding, wood and trim, stucco, masonry, cement composition siding, galvanized metal, and previously painted surfaces. Take Heed: Apply two coats of Best Look® Paint and Primer in One Exterior Paint. For best results, utilize the recommended primer for the specific surface application. Color Solutions® Interior and Exterior Paint is a prime paint that provides excellence, performance and stunning color in a fluid durable finish. This paint distributes washability, good hide, and stain resisteance and is backed by our satisfaction guarantee! Color Solutions® Self-Priming Paint conforms to your style and simplifies your painting venture. Bring your color schemes to duration with Best Look® or Color Solutions® Paints. With the wide-ranging Do it Best Quality Paints® color palette, showcasing brand-new colors, you can unearth the perfect color for every venture in your home dwelling. When that next project is getting started, visit Zettler Hardware in Powell, Pickerington, and Columbus for most of your painting needs. Let's not forget we carry all of the paint supplies that you need as well. Start Painting Now!